I think it's important to keep JRPGs separate. Rygarmanias, in my opinion, should have a focus on realtime combat and platforming instead of menu-based battles. Ys III: Wanderers from Ys almost fits because of the switch to a side-view perspective, but the only overhead section is when you're selecting your location to travel on the world map. Judges? exactly. i almost forgot that i'd made the point about platforming and action-oriented play earlier and posted that ultima 1 beat all them games at the multi-perspective, NPC interaction game. no platforming action. a requirement for a rygaresque gaming experience. An objective fact is that Rygar features character level progression and statistics (your Tone and Last) that increase your hitpoints as well as the damage you deal to enemies. Castlevania II: Simon's Quest, also features a leveling system based on gaining experience points in combat. However, the leveling system in that game merely increases your health - it does not increase the damage you deal to enemies. Simon's Quest predates Symphony of the Night by 10 years. Regardless, Rygar predates Simon's Quest. That is why the we must discuss rygarmanias. Man blaster master and guardian legend are real close but I don’t think you talk to any NPCs. Ganbare Goemon 2 and maybe others in the series for the this! Right? Side scrolling, NPC talking, perspective change for the first person parts in the mazes. True, I think most Goemon games after the very first one would qualify. River City Ransom could be considered a rygarmania game. The perspective shift is tricky, but in an esoteric sort of way I think it's there since you almost always move left to right even if the logical sense of going between areas would mean the opposite directions. It's like the scene flips. It doesn't have the item collecting though, just shop-based upgrades that were an inspiration for SotN's librarian. edit: thx for the fact check moonie! Game series X combines series Y with element Z.
SotN takes the Super Metroid design and adds RPG elements, then slaps a Castlevania story on it. The only Vania contribution is the story, setting, characters; basically just the lore. So if you take all the following games that did Metroid + RPG elements but no CV lore, how can you call them Metroid-vanias when there is no -vania element left? 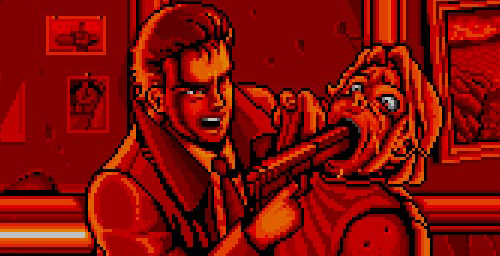 So, consider instead: River City Ransom was a much earlier game that added RPG elements to a traditionally action genre (permanent stat-building, collecting money to buy upgrades in a shop), so we should really retire the misleading M-V term in favor of Riverroid. That logic can easily apply to the prefix Metroid. You're also missing that SotN is not the only Castlevania entry to use that format; all of the GBA and DS Castlevania games follow that format which establishes precedent. If anything, the -vania suffix is more relevant because there are more Castlevania games that follow that mold than there are Metroid games. But if you're that bothered about the name then you can go back and just call them Adventure Platformers or Adventure games or Action Adventure. Huh? What Matt is saying is that SotN did not invent anything original, yet gets 50% credit for a genre. So the term shouldn't exist in the first place. But since it does, it still makes no sense that non-CV games are called that, because the "vania" portion of the name is specific to the Castlevania series. I'm not sure how that can apply to Metroid as well. May as well call Souls-like games FallenSouls games because Lords of the Fallen is at least 50% responsible for the popularity of the genre. That logic can easily apply to the prefix Metroid. Given Mike's qualifications neither Metroid nor Castlevania's non-linear iterations need be included in this discussion as they lack the perspective shift and proper NPC interaction. This allows a further delineation between the genres as the core of one is exclusive to the core of the other (Rygarmanias are 'troidvanias but 'troidvanias aren't Rygarmanias).